1. Heat 1 tsp of oil add whole green green chillies, kothmir/Coriander, pudina and tamarind paste. Let it fry for a min then add the cut tomatoes. 2. Put the lid and make the stove to medium flame. 3. Check it after 5 - 10 mins, you can see that the water came from tomatoes starts leaving, at this point keep the lid open. 4. After some time you can see only little liquid is left, switch off the stove and let it cool. 5. Take out the green chillies from it and grind it to fine paste along with the sesame paste, add salt. 6. Take a big spatula and try to mix the tomato mixture so that it becomes fine paste. Now add the green chili and sesame mixture, mix well. 7. Finally heat some oil for seasoning, add curry leaves, mustard seeds, dry red chilli's, fry for few seconds, put it in the tomato mixture immediately. 8.Tomato chutney is ready:)can be served with roti, dosa, puri or white rice. Recipe Source: My mom's own creation. Yes, this seems to be a good recipe for tomato chutney. Thanks for posting it. Hoping to see a lot more Hyderabadi recipes from you. 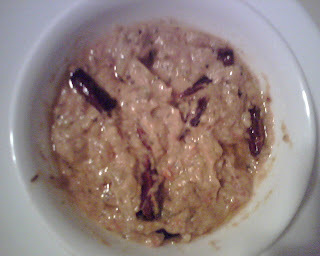 Hi H.Chutney looks yummy.I made some today,just onion and tomato.You have more spices which I like better.Tahnks. This chutney looks yummy .thanks for sharing. actually my family luvs ur dishes.till now whatever i tried ur dishes it came well.i like u to post hyderabad mutton biryani,hyderabad vegetable biryani too. Hello Asha, try it and let me know. Thanks for signing up and we value your support in this call to Hyderabadi Bloggers. Push, pull or do whatever to bring more people join the event of uniting Hyderabadi Bloggers. First time commenting here and must say that you blogged some nice recipes. Your mother's tomato chutney recipes sounds great. Will give it a try. Tomato chutney sounds nice!will give it a try soon.I used to make a similar chutney when I was in school,mostly out of interestI just put together some ingredients including tomato and sesame seeds.But now I have forgotten my recipe.Thanks for posting yours.will make it soon. thanks for visiting my blog and dropping ur great comment.tomato chutney is looking good.i never tried this version. Being from hyderabad never heard of this chutney. looks nice. The author of hyderabadi-kitchen.blogspot.com has written an excellent article. You have made your point and there is not much to argue about. It is like the following universal truth that you can not argue with: The more work you do on a website, the further it seems from completion Thanks for the info.